Argentina players want Jorge Sampaoli kicked out before Argentina’s last game against Nigeria, with Sergio Aguero hitting out at his manager after the crushing defeat by Croatia. 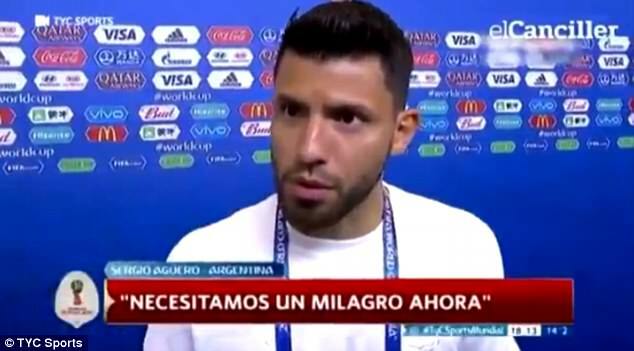 Manchester City striker Sergio Aguero was in no mood whatsoever to hang around after the match as he stormed out of his very brief and heated interview, where he appeared to hit out at Sampaoli. Argentina were defeated 3-0 on Thursday, leaving them on the brink of World Cup elimination and after the final whistle, Sampaoli admitted that his ‘project has failed’ and that he struggled to find a system to get the best out of Lionel Messi and Co.
And when Sampaoli’s strong words were put to Aguero – substituted after the first goal went in – the striker ominously replied: ‘Let him say what he wants’, before quickly walking away. The Argentina Football Association is hoping tempers cool before the final match against Nigeria but Jorge Burruchaga has already been consulted to take over. Summing up the chaos that currently engulfs Argentinian football, Sampaoli, despite having an indifferent track record, has a five year contract that would cost £17.5m to get rid of him. Argentina are still paying two of the coaches they sacked during their troubled qualification phase – Gerardo Martino and Edgardo Bauza. The likelihood is that he stays but with players already harbouring grave doubts before the Croatia debacle, he will need to repair relationships quickly before the final game. Meanwhile, Croatia qualified from their group with a match to spare thanks to goals from Ante Rebic, Luka Modric and Ivan Rakitic. Croatia take on Iceland in their final group game, while Argentina face Nigeria needing something special. Yeah. He should be fired. He deserves that.